Labour leader Jeremy Corbyn recently floated the possibility of a “third way” for Britian’s nuclear weapons policy: instead of either complete nuclear disarmament or replacing Trident with a like-for-like system, he has suggested building replacement submarines that “don’t have to have nuclear warheads on them”. He has been ridiculed in the press – but the idea deserves serious thought. The practice of nuclear deterrence in the UK has long been associated with having one or more nuclear-armed ballistic missile submarines at sea at all times, invulnerable to attack and ready to fire tens of thermonuclear warheads at short notice, each capable of inflicting massive and indiscriminate nuclear devastation. But this isn’t the only way to think about nuclear deterrence, or the only way the UK can use Trident submarines. Rather than thinking of nuclear deterrence as an all-or-nothing proposition – you either do it this way or you don’t do it all – it’s more accurate to think of it as a spectrum of possible postures. At one end lies the “maximum deterrence” practiced by the United States during the Cold War. This was based on nuclear superiority over the Soviet Union, and tens of thousands of weapons, ranging from nuclear shells for front-line troops to vast fields of inter-continental ballistic missiles. Then comes what the UK, France and China currently practice, which is often called “minimum deterrence” based on smaller numbers and more limited roles. But there are also strategies of just the sort Corbyn is suggesting. The first of these is the “recessed” or “virtual” deterrence, the sort practiced by India through the 1980s and 1990s, which is based on the non-weaponisation of a nascent nuclear weapons capability – a “bomb in the basement” model, where everything is in place to deploy within several weeks or months but not permanently ready to launch. This was seen as enough to deter Pakistan at the time. The next move along the spectrum goes from non-deployment to non-production of nuclear weapons. This is often used to describe the position of Japan, sometimes Brazil, and perhaps in the future Iran. This has been called “weaponless deterrence”, meaning a state has no nuclear weapons or components but has the necessary fissile materials and industrial base to produce nuclear weapons within a year or two. Taking such a step “down the nuclear ladder” rests on a judgement that UK security no longer requires a permanent and assured capability to inflict nuclear violence upon other countries at short notice. The Cabinet Office investigated some of these different ways of thinking about nuclear deterrence in its 2013 Trident Alternatives Review at the behest of the Liberal Democrats in the coalition government, who never accepted the case for a like-for-like replacement of the Trident system. The idea of reducing the readiness of nuclear forces, or “de-alerting”, is also part of a package of measures long advocated by non-nuclear-weapon states to diminish the role of nuclear weapons. This includes removing nuclear warheads from delivery vehicles, as Corbyn has suggested. There is precedent here. In the 1990s, former CIA Director Admiral Stansfield Turner advocated a policy of “strategic escrow” – de-alerting US and Russian nuclear weapons by removing warheads from their delivery vehicles and securely storing them some distance away in facilities open to external inspection, so that eventually there would be no nuclear weapons immediately ready to fire. The US did exactly this with its nuclear-armed Tomahawk cruise missile arsenal for nearly two decades. In 1992 the missiles were withdrawn from operational status, but plans were put in place to enable their redeployment in a crisis. This included periodic certification of a number of submarines in the US’s Pacific and Atlantic fleets to ensure they could deploy and fire the missiles within 30 days of a redeployment decision. 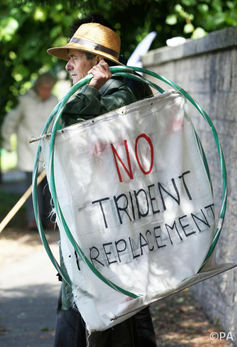 The missiles were eventually retired in 2010. The UK could also do other things with its ballistic missile submarines. Rather than remaining single-purpose, inflexible and enormously expensive nuclear delivery machines, they could be adapted for a host of other military missions. The US did this in the 2000s when it withdrew four of its Trident missile-carrying submarines and converted them for conventional war-fighting roles. Most of the Trident missile tubes were converted to accommodate seven Tomahawk cruise missiles each, a huge increase in conventional fire power. The remaining missile tubes were adapted to carry equipment and supplies for special operations forces or to deploy unmanned aerial and undersea vehicles for intelligence gathering. It would be difficult to quickly and easily re-role UK submarines, but it could be done over a period of time should the government decide that the UK faces a permanent existential nuclear threat (the government accepts it doesn’t now and hasn’t since the early 1990s). So Corbyn’s idea of a third way is hardly without merit. Alternative nuclear postures and conventional roles for Trident’s planned “successor” submarines are certainly possible, ones that reduce the role of nuclear weapons and open up the possibility of further scale-backs. The real problem is that Corybn has floated the idea mostly to placate the powerful Unite and GMB unions, which represent the manufacturing and engineering jobs at Barrow where the submarines are built, and at Faslane and Devonport where they are maintained. And it hasn’t even achieved that: the GMB has already said it won’t support it. More importantly, the fact that Corbyn’s commitment to nuclear disarmament has been ridiculed as retro hard-left fantasy demonstrates just what a powerful cultural grip nuclear weapons have over our politics – this at a time when the vast majority of countries in the world support precisely Corbyn’s nuclear politics. In fact, 121 countries have recently acceded to the “humanitarian pledge” pioneered by the Austrian government in December 2014 to “fill the legal gap for the prohibition and elimination of nuclear weapons” and “stigmatise, prohibit and eliminate nuclear weapons in light of their unacceptable humanitarian consequences”. So there’s actually a perfectly good rationale for Corbyn to stick to his nuclear principles, as Green MP Caroline Lucas has urged. He could, instead, propose the UK order more nuclear-powered but not nuclear-armed Astute-class attack submarines, thereby maintaining the much-prized submarine industry. Of course, such conventional capabilities are designed for just the sort of military interventions to which Corbyn is steadfastly opposed – and that’s another argument altogether.